Tropical Parfaits make my day when paired w/exciting news! I woke up this morning refreshed and read to go after an awesome 8 hour sleep. Isn’t it amazing how much a little sleep can improve your outlook on this. My day, week, YEAR was made this morning when I had the opportunity to conduct a super cool interview that I have been looking forward to for a week now! No worries, you all will see the write up next week sometime and I guarantee you will love it! I cannot wait to share all the great info I got today. Layers and layers of fun to eat! Dark Agave Nectar is more like brown sugar – deep, rich and amazing on greek yogurt! 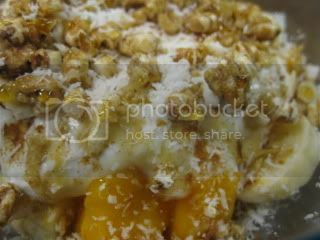 I made sure I got a little Mango Goodness + Banana + Agave Sweetness + crunch in every bite! 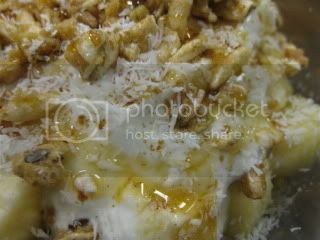 This was such a fun breakfast to eat that was dessert like ~ rich, creamy, sweet, crunchy and just plain YUM! It will definitely hold me over for hours with the protein and fiber so I shouldn’t need a morning snack. Today is the last day to win some Holey Donuts. Click HERE before it’s too late! Have a Terffic Thursday all ~ I am off to do Body Pump at lunch and find two more uses for that fabulous Southwestern Turkey that we had last night! See you all later! That *almost* looks too decadent for breakfast! I can't wait to hear more about that interview! Niiiiiiice parfait! Kashi Crunch is the best cereal known to man! Brandi ~ I am soooo excited to share the interview with you all. Now I just need to get it all typed up. Jenny ~ So true – can you send some my way?! Gera ~ You should definitely try it out! Heather ~ I absolutely agree – I LOVE Greek Yogurt -it makes every meal amazing! 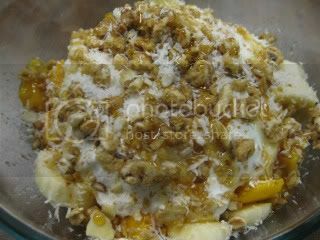 K ~ Kashi crunch rocks – it has such a crunchy, nutty flavor! heck yeah a good night of sleep is worth a lot…seriously after a few nights of not great sleep I'd be willing to pay quite a bit for it! 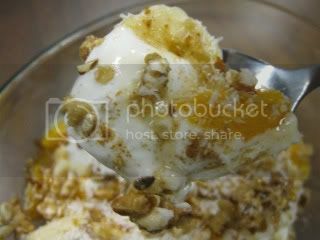 Mmm that parfait looks so good!! RunToFinish ~ I totally get that! When I am run down, I'd pay just to have everything get done so I can sleep. April ~ The parfait was amazing – you should try it!